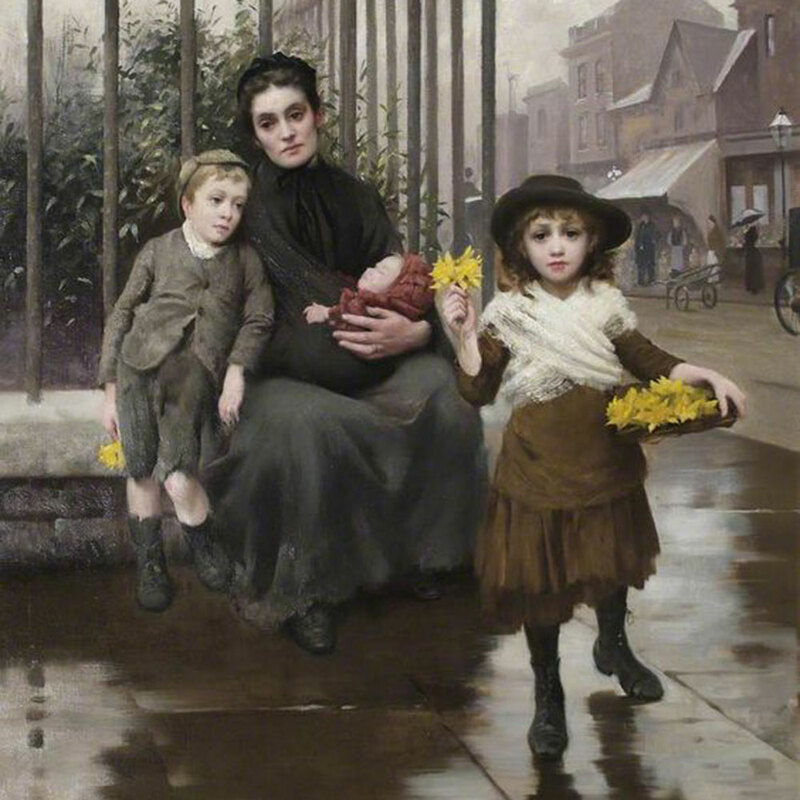 Hosts of golden daffodils herald the arrival of Spring in the north. By April they can be found fluttering and dancing in the breeze throughout the Lake District where Wordsworth was inspired to write his famous poem. Hundreds of thousands of daffodils also carpet the New York Botanical Garden in Spring. 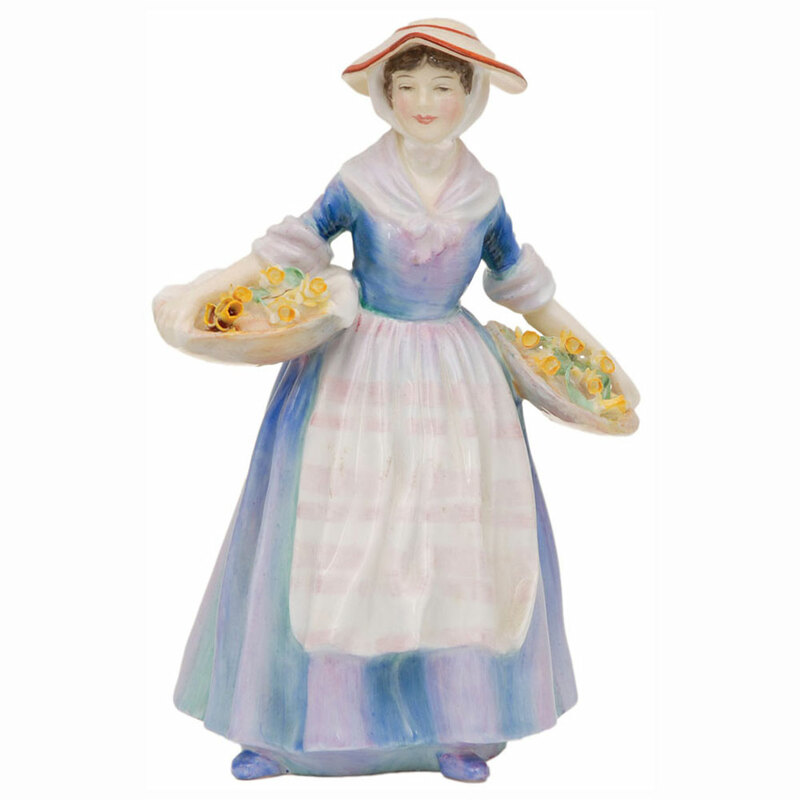 Seasonal flowers were once sold by London street vendors, such as this Daffodil Woman modeled by Charles Vyse. 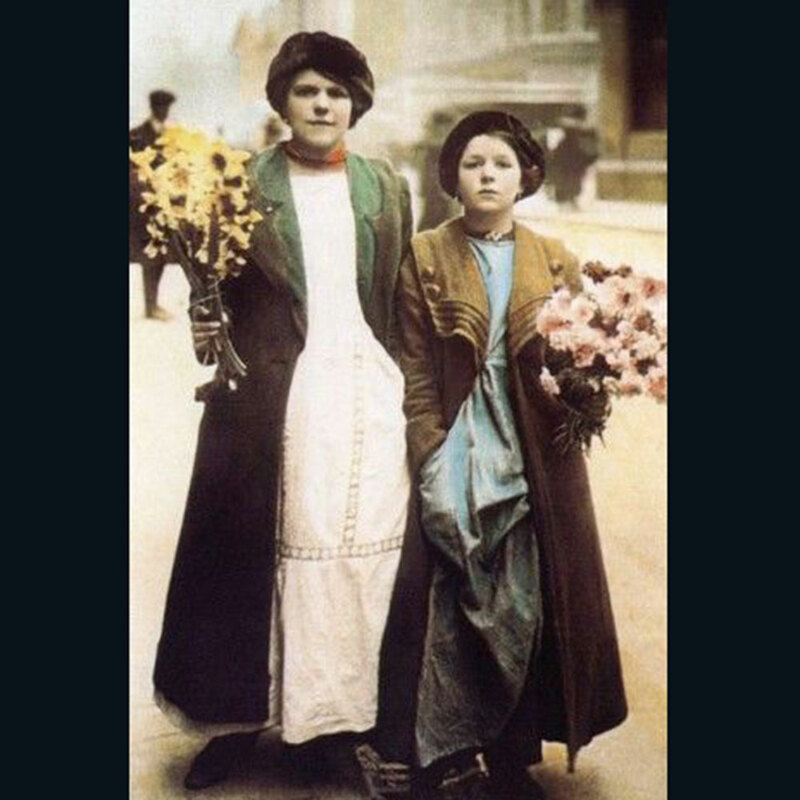 Victorian London was alive with colorful flower sellers calling for custom with their melodic cries. 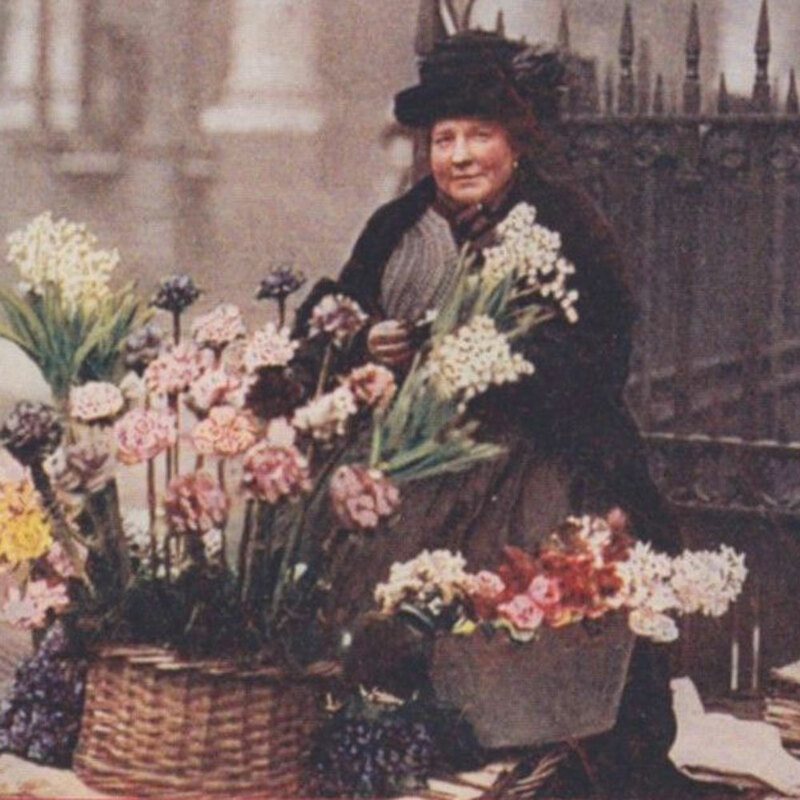 In 19th century London, there were more than 3,000 street vendors, who bought their flowers at Covent Garden market and tied them into halfpenny and penny bunches. 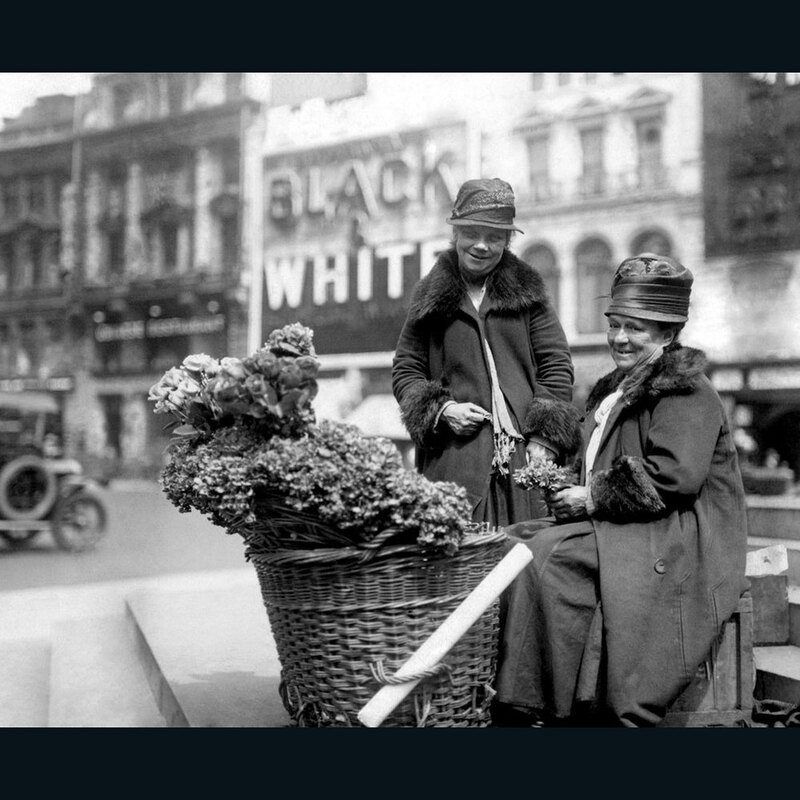 Throughout the day they gathered around the steps of Eros in Piccadilly Circus or strolled through the theater district with their baskets of daffodils, primroses and roses for sale. 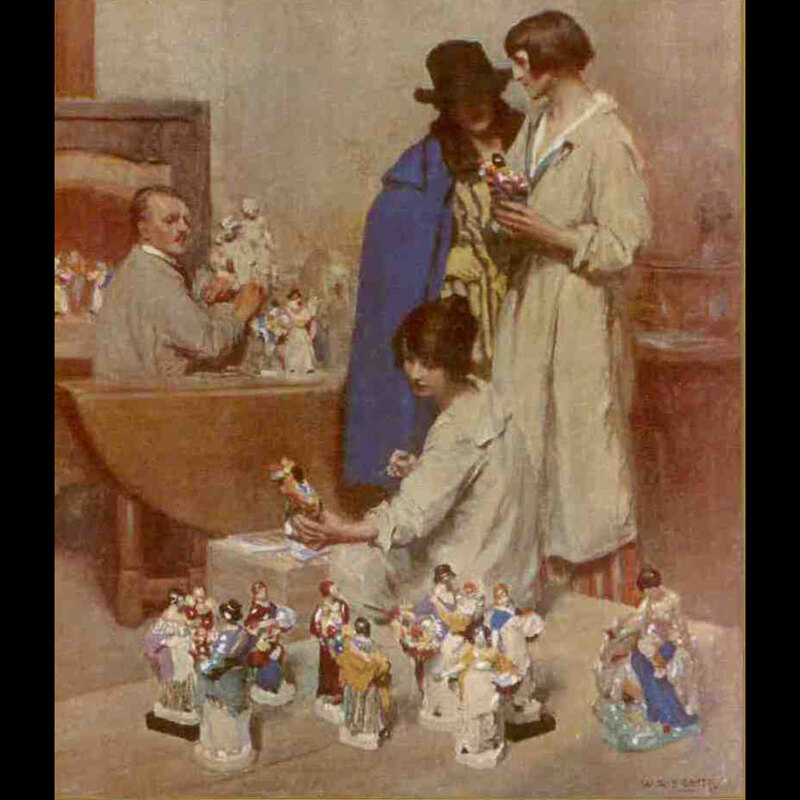 This was the setting for the story of Eliza Doolittle, the flower girl portrayed in Shaw’s Pygmalion and the musical version My Fair Lady. 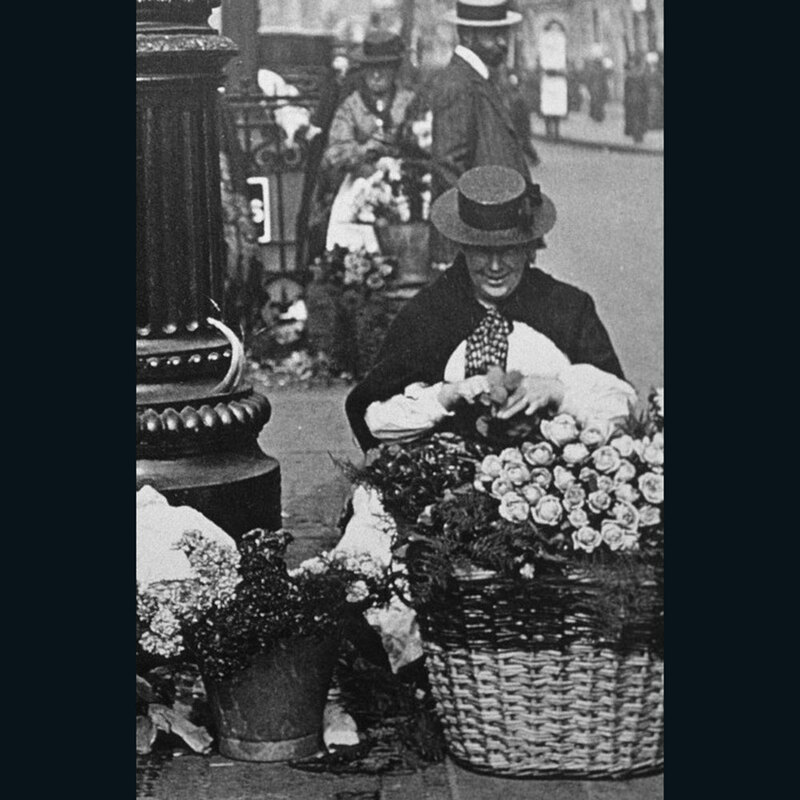 As the flower sellers began to disappear from London city streets in the 1920s, photographers such as Emil Otto Hoppé recorded their lifestyles and artists began to portray them nostalgically in paintings and sculptures. 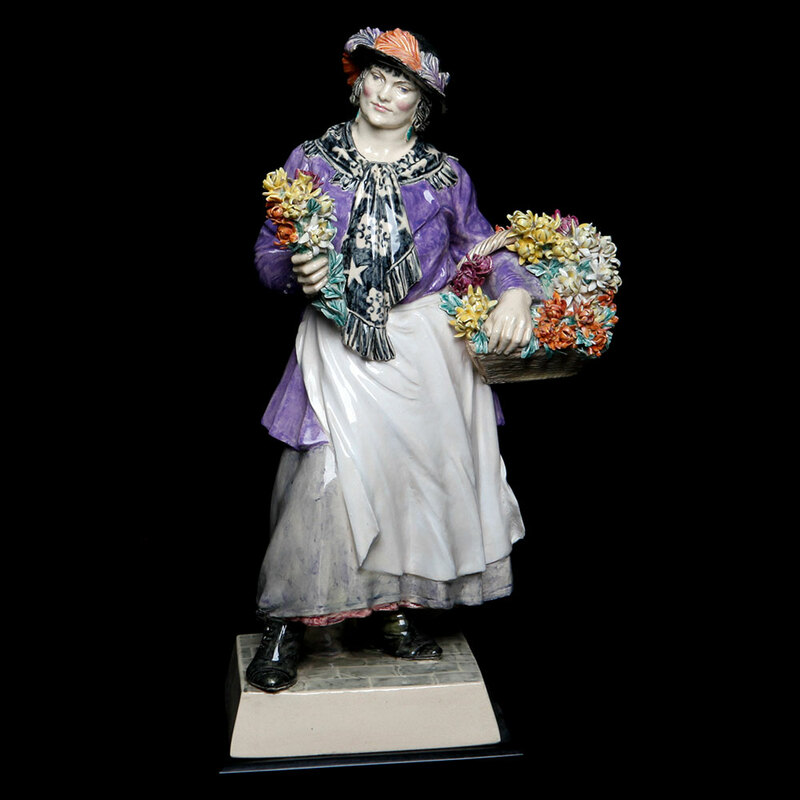 Ceramic artist, Charles Vyse, was fascinated by these hardy women and his clay models were individually hand-painted and accessorized with flowers by his wife Nell at their studio in Cheyne Walk, Chelsea. 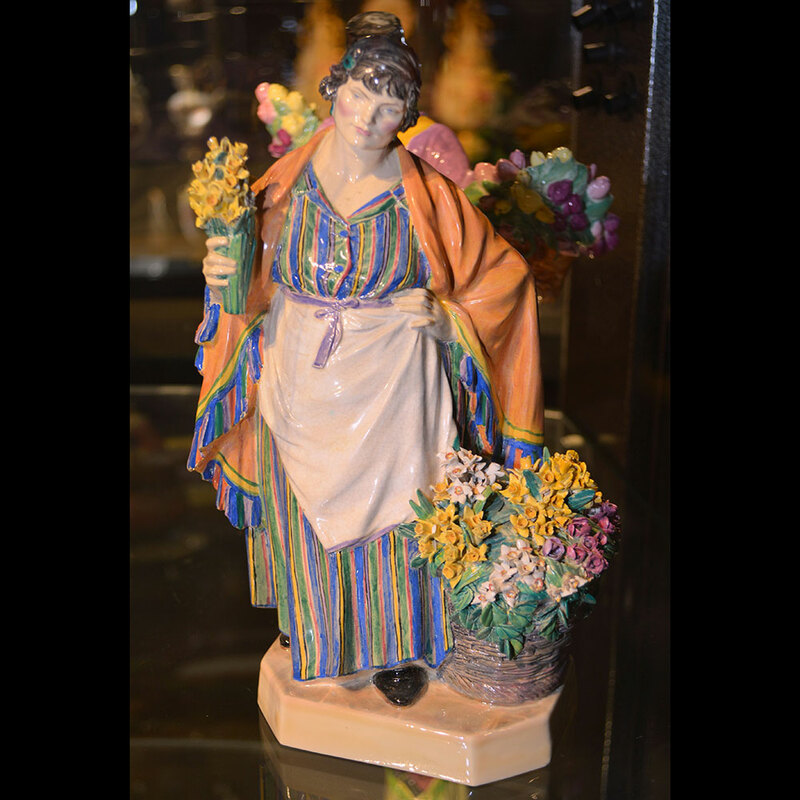 The marginalized communities that they immortalized in clay included gypsies, flower sellers, and street entertainers, who eked out a living on the streets of London. 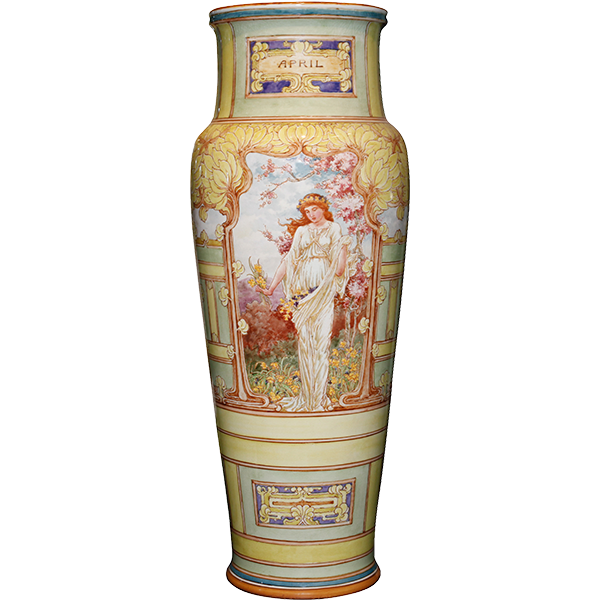 Each Vyse model was painted differently and the women all wear vividly patterned costumes with free-hand stripes and floral sprays. Even the babes in arms are clothed in a myriad of fabric designs. The flowers were all painstakingly created petal by petal in moist clay and arranged in baskets, bunches, buttonholes and nosegays. 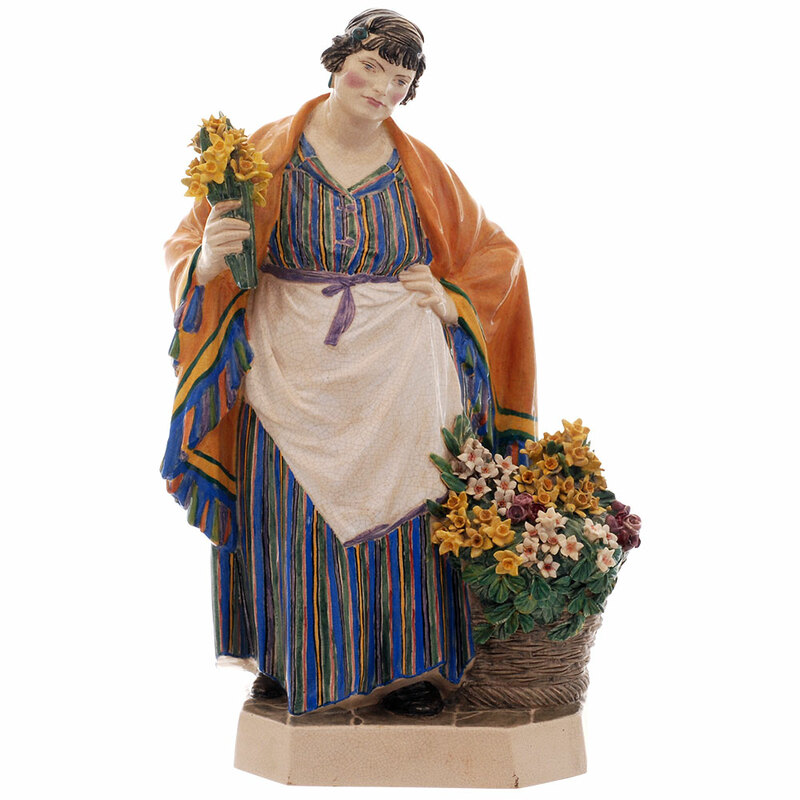 The WMODA collection includes two different versions of the Daffodil Woman, with different length skirts and aprons. One even sells roses instead of daffodils. 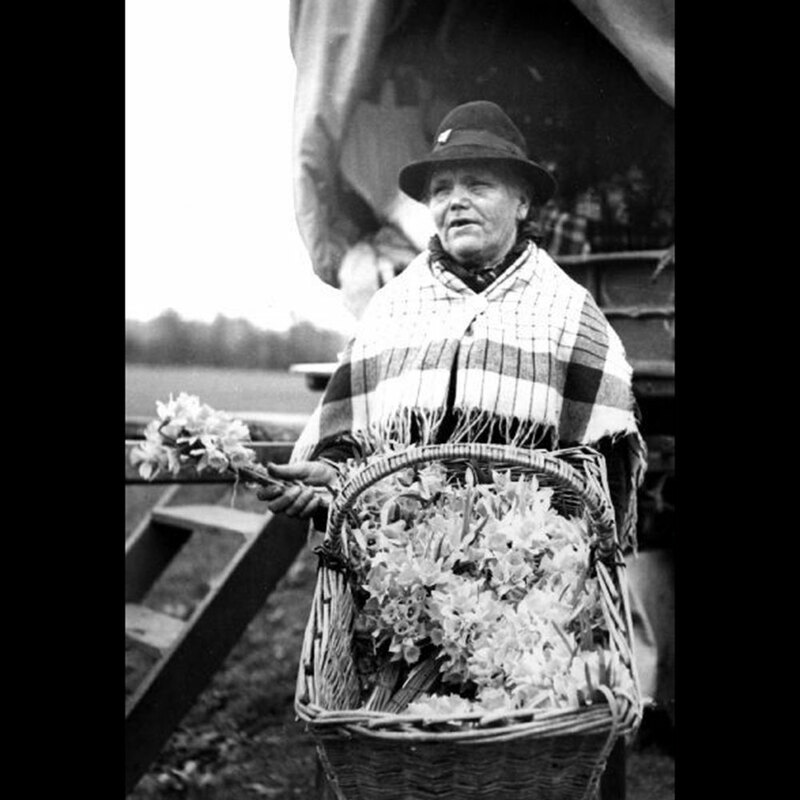 Between 1920 and 1935, Vyse modeled nine different flower vendors selling lavender, tulips, chrysanthemums and roses. 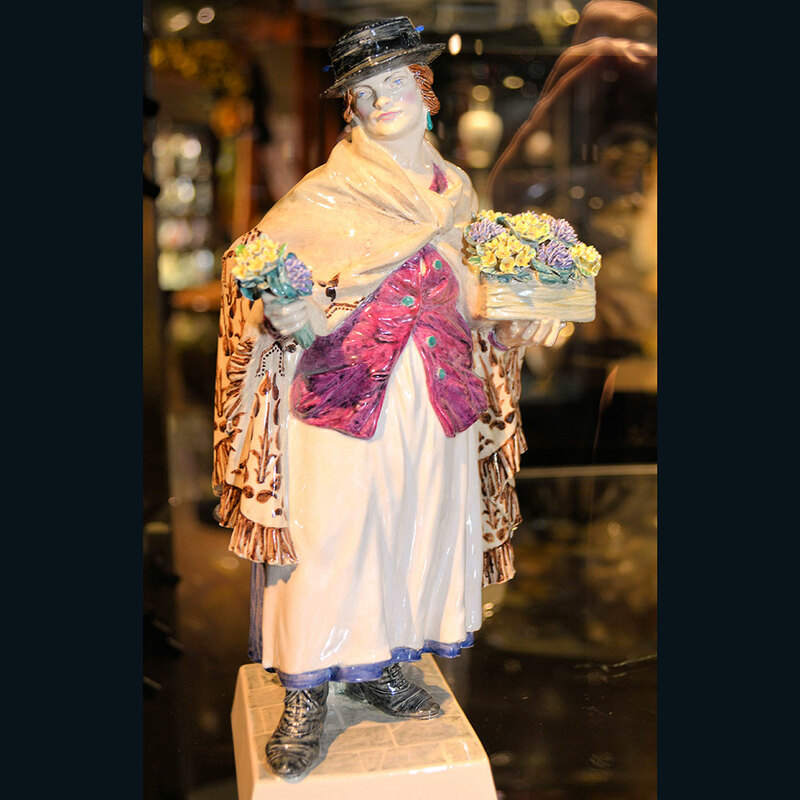 His Piccadilly Rose Woman bears a close resemblance to Polly Beauchamp, one of the most famous flower sellers in the world thanks to her location under Eros. 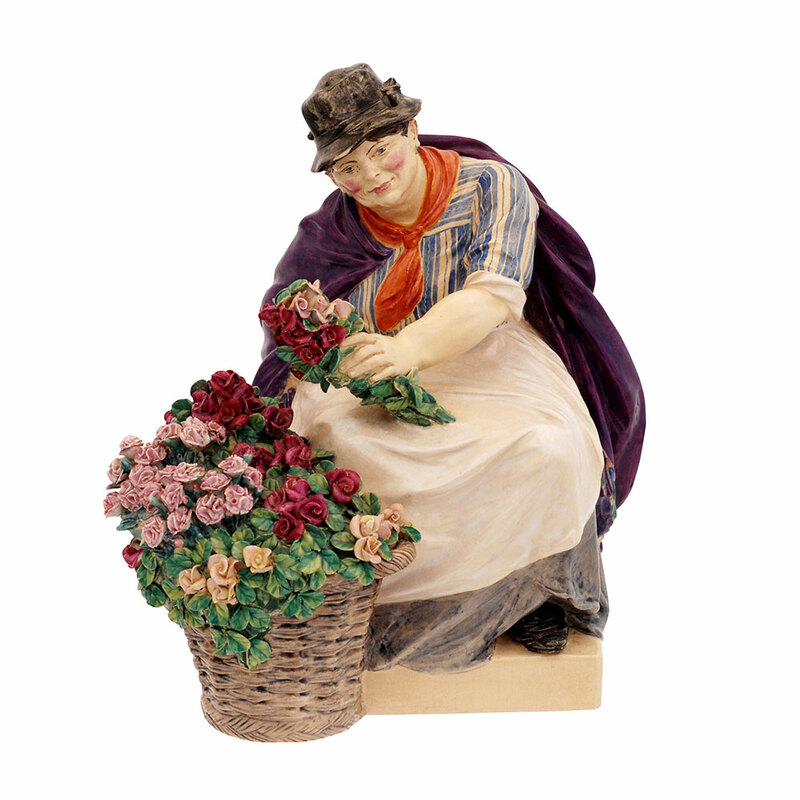 Vyse’s street vendors influenced Leslie Harradine’s figures for Royal Doulton during the 1920s and 30s. Harradine was also inspired by the ‘Cries of London’ paintings by Francis Wheatley from the 1790s. 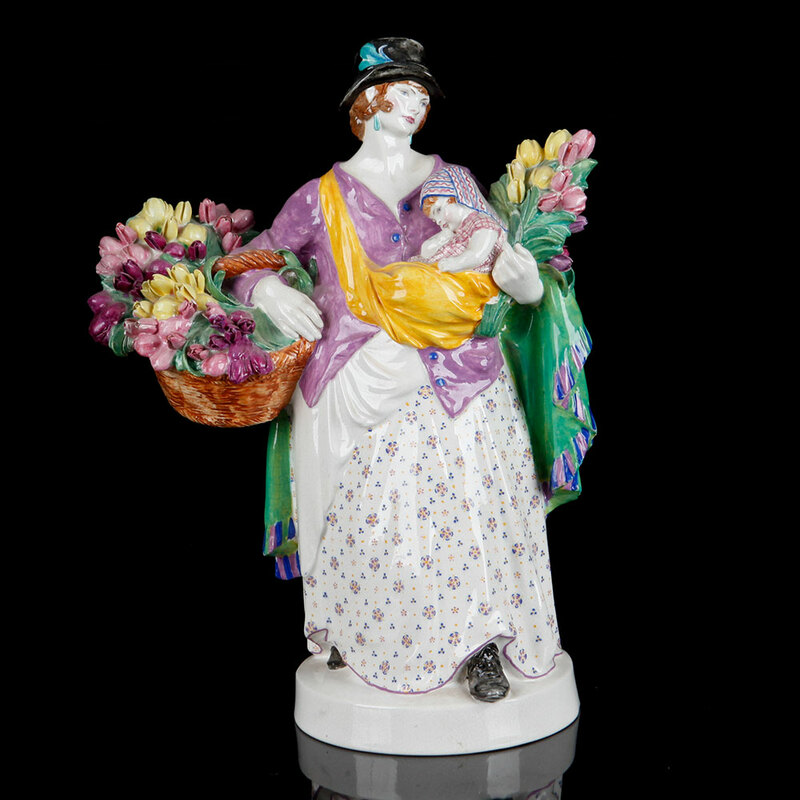 His Daffy Down Dilly figure depicts a romanticized flower seller in 18th century dress and takes its name from a Mother Goose nursery rhyme dating back to the 16th century. 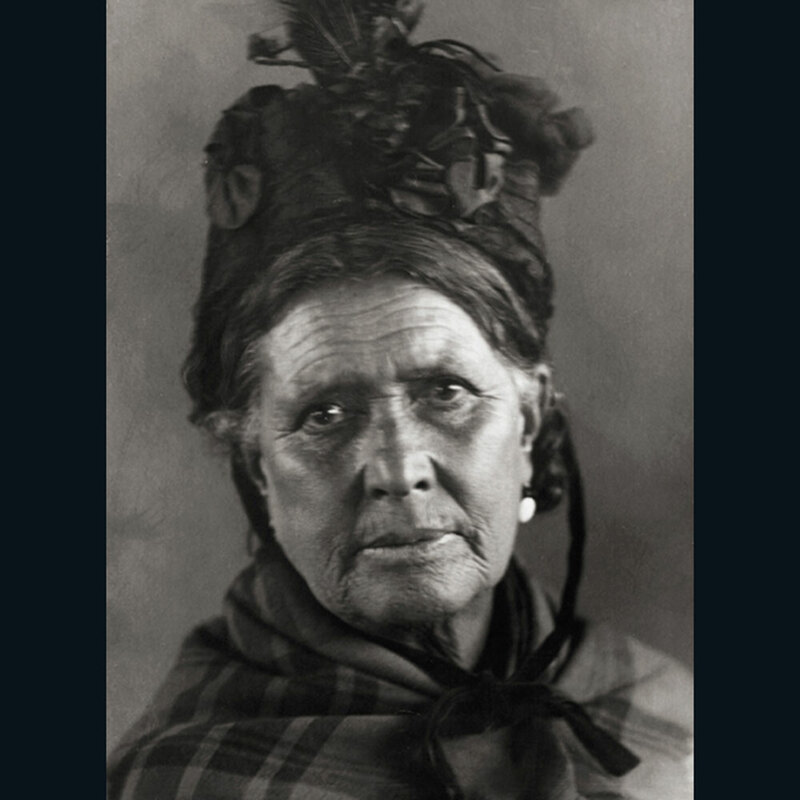 The name Daffy-down-dilly also came to represent an effeminate man and features in the story of a work-shy mother’s boy by the 19th century American author Nathaniel Hawthorne. 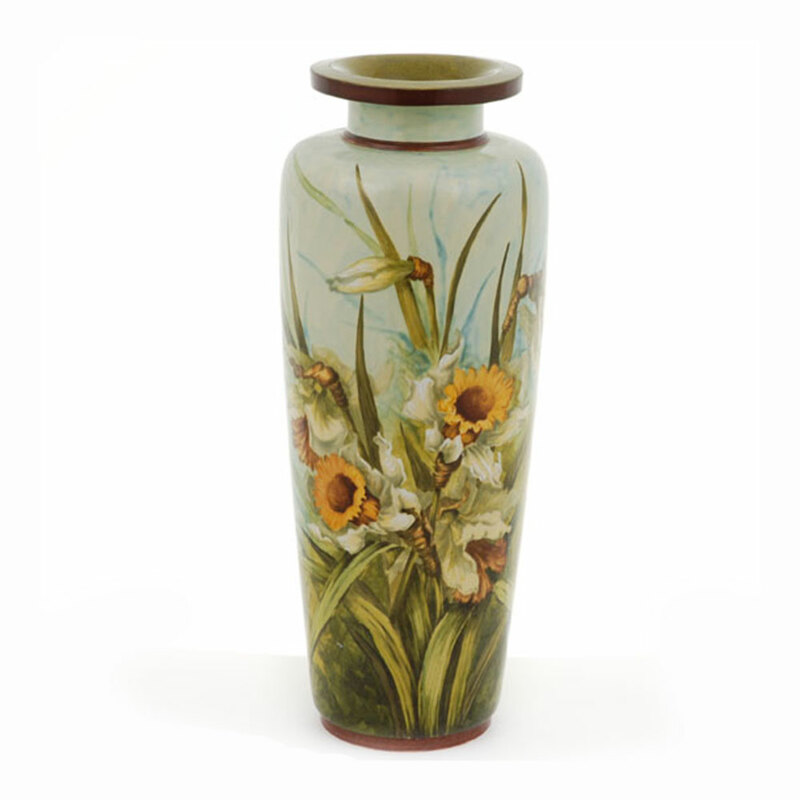 For Victorians, flowers were the language of love in secret courtships and feelings of intimacy were expressed through carefully chosen blooms. 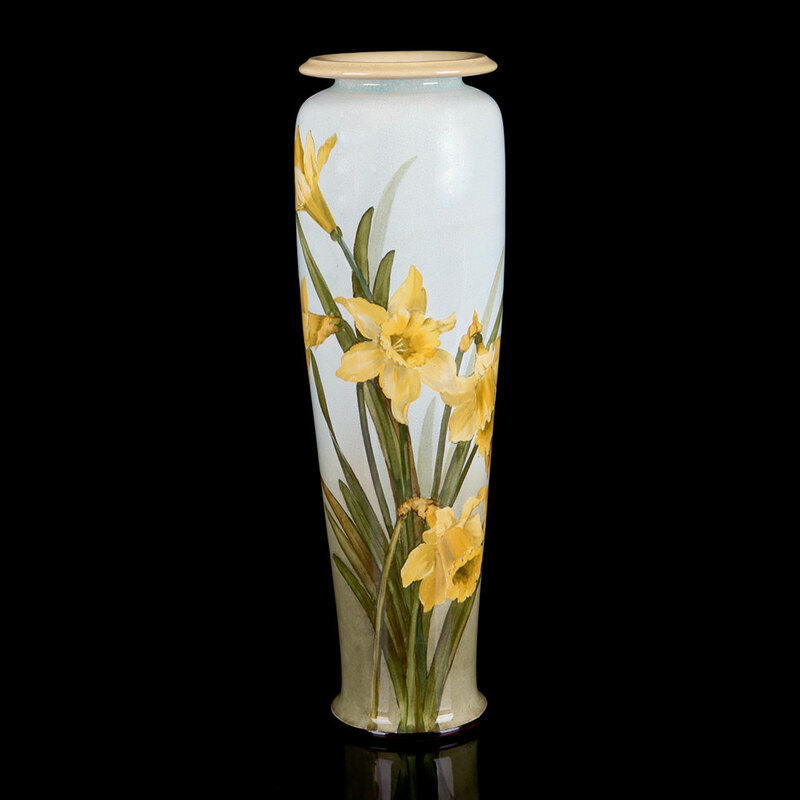 Daffodils mean “regard” and a bunch brings “joy and happiness”. 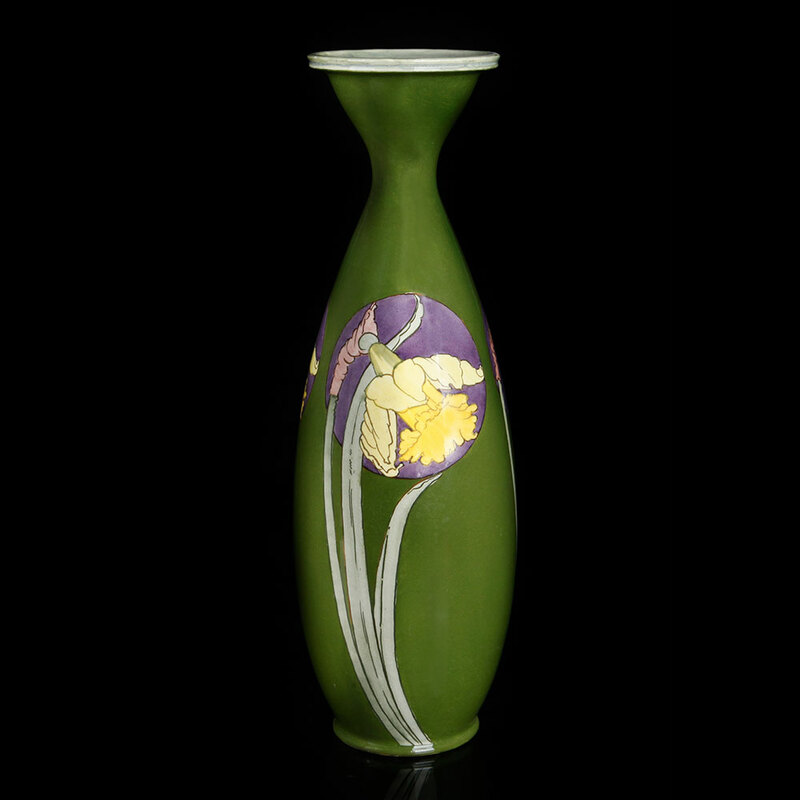 Doulton artists at the Lambeth Studio painted daffodils on stylish turn of century vases in blossoming art nouveau style. Today the daffodil is a symbol of hope in the fight against cancer and scientists also believe that extracts from the plants could be used to stop tumor growth.